One of the hardest things for a new driver is to learn to correctly estimate the vehicle's location on the road and to position the vehicle exactly where it needs to be. The task is not made any easier by the fact that much of the driver's view is blocked by parts of the vehicle, i.e. the vehicle's hood or the dashboard. 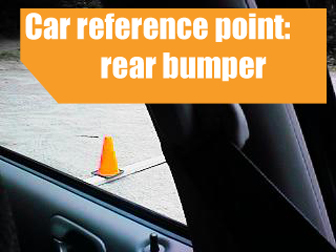 Reference points help drivers to overcome this issue and allow to make better judgments regarding the vehicle's position by serving as visual guides. 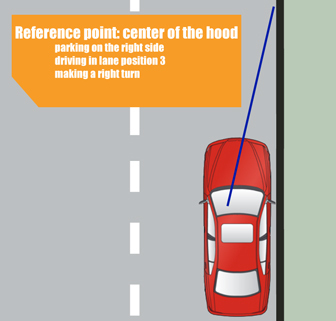 Learning correct reference points for parking is especially important since this will directly impact the driver's ability to parallel park. 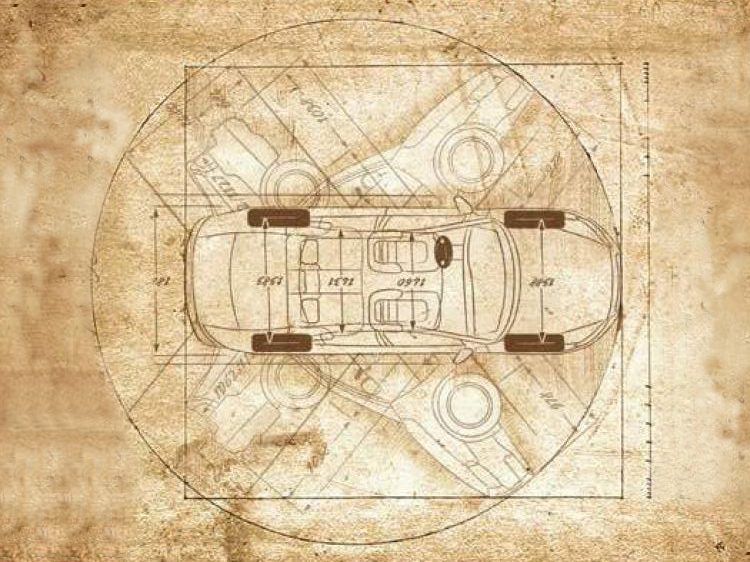 One thing to keep in mind when studying car reference points is these are just standard reference points and they may not be the exact match to your vehicle. Your vehicle may be shorter or larger than the vehicle used in these examples and so your vehicle reference points may be somewhat askew. They will still be very close to the standard, but you should always check the reference points for the vehicle you are driving and memorize them. Side position reference points allow drivers to estimate where the vehicle is located in relation to one of the curbs or pavement markings. 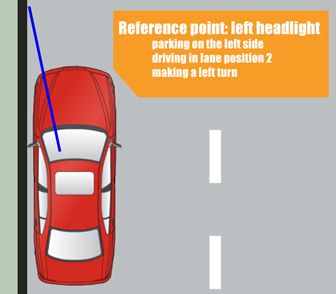 Side position reference points can be used when you are driving and are choosing a lane position or when you are trying to park the vehicle. When you need to park the vehicle on the left side of the street, your left headlight makes for a great reference point. 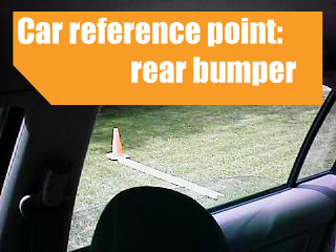 Draw a visual line through the point where the left fender meets the hood of the vehicle. This point lines up with the curb/lane markings when the vehicle is just 3-6 inches away from the sideline. The center of the hood is a great reference point that allows you to get very close to the right curb without actually hitting it. When the curb appears to intersect the center of the hood – you are in that sweet spot when your right wheels are just 3-6 inches away from it. When you are coming to a full stop before the stop line, you have to be able to judge the position of the front part of your vehicle. 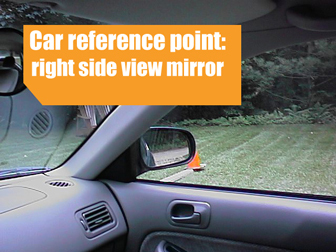 Side-view mirrors serve as great car reference points in such cases. 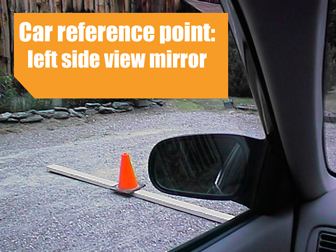 The picture on the left demonstrates how a stop line would look next to your left side-view mirror if you stopped just before the line. The picture on the left demonstrates how a stop line would look from your right side-view mirror if you stopped just before the line. In reality, you will not see the stop line from your right side window if you are standing in the right lane. Knowing the rear limit of the vehicle is important when you are backing up and parallel parking. Looking over your right and left shoulders through side windows should help you relate the position of the vehicle to the curb line. The image on the left demonstrates a curb line when the vehicle's read end is positioned right next to the curb and the driver is looking over the left shoulder. Note: you can use the door handle as your reference point. This image demonstrates how the curb line appears in the side window when the vehicle's rear end is positioned next to the curb and the driver is looking over the right shoulder. you can use these reference points for parking! 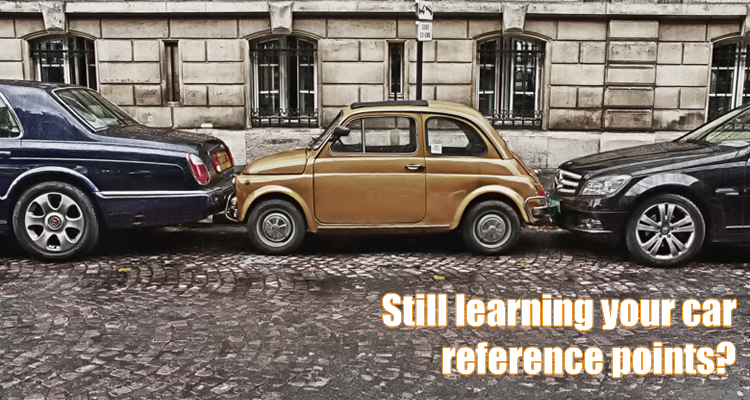 Parallel parking is a breath when you know how to correctly position your vehicle and learning your vehicle's reference points is essential for that!